In its 51st year, the massive consumer technology convention is full of surprises. For a real sense of the power and scope of CES, here's an Entrepreneur-eye-view, beginning before the event even started, into what it's like to be in the midst of it all. The airport brings the first signs. Given that there were multiple people discussing their CES plans on my flight from New York, I wasn't surprised to see this greeting at the McCarran International Airport baggage claim. Last year alone, more than 180,000 people descended upon Las Vegas for CES. The Las Vegas Host Committee welcomes this influx of tourists to the city. This queue for CES badge pickup, located at McCarran International Airport just steps from the baggage claim carousels, had an estimated wait time of more than 45 minutes and extended beyond the stanchions set up for crowd control. The man holding the paper in the foreground was walking around with a list of other pickup locations, encouraging people to go elsewhere to retrieve their credentials. I only had to wait behind three people at my hotel to get mine, but I'm sure I'll have stood in my share of lines before the week's end. A CES-adjacent event on the eve of CES. The Pepcom Digital Experience "Technology Tailgate” was held at the Mirage Hotel & Casino on the evening of Jan. 8 and featured more than 200 exhibitors, from Polaroid to Samsung and startups. While the event comprised a small sample of the companies present at CES throughout the week, it was a great way to see some products that I'd heard about through publicity emails. It was a chance for journalists get the first look at a cross section of products in a casual setting, complete with booze luges and bites (including three kinds of mac 'n cheese). A robot to help older adults message loved ones. ElliQ, a robot by Intuition Robotics which is designed to engage with older adults, was on display at Pepcom. ElliQ suggests activities (such as taking medication and playing games) and is set up with a proprietary tablet that allows loved ones to send messages, voice memos and photos on an interface that is more simplified than social-networking platforms. ElliQ is currently in beta after a test run with 150 users and is the winner of the CES Best of Innovation award in the Smart Home category. Yesterday, the company announced new investment from Samsung NEXT, Sparx Group and Glory Ventures (total funding to date is $22 million). Other investors have included Toyota AI Ventures and iRobot. One challenge for Pepcom exhibitors was the noise level in the crowded hall when it came to voice assistant technology and products with speakers. Some, such as Intuition Robotics CEO Dor Skuler, overcame it by speaking into a lavalier microphone. Serendipity! Running into an old source. Amid thousands of people at Pepcom, I managed to spot Marlo Anderson, a serial entrepreneur whom I'd interviewed a few months ago about his company National Day Calendar. (We spoke via phone in October, so thank goodness for nametags). National Day Calendar is a website Anderson founded to examine the history of days such as "National Popcorn Day" that has become an authority on the existence of such special holidays, keeps an official list and even approves new ones. These little robots, called Keecker, move from room to room and project media such as TV shows and movies onto walls and surfaces. They can also respond to voice commands, learning home floorplans so they'll go to the living room when directed, for example. At Pepcom, members of the media sat on the floor to capture the smart TV interface projected by Keecker on a tablecloth. The French company launched on Kickstarter and made a splash at CES four years ago. Keecker became available for purchase last month. Not all work -- some play. The attendees of Pepcom who weren't watching the NCAA championship game were briefly alarmed when collective shouts erupted from opposite corners of the room where TVs had been set up and fans had congregated. A quick way to print objects. Glowforge, a 3-D laser printer company, is making its CES debut this year. Its demo station allows visitors to draw a design for a luggage tag, photo frame or puzzle and have it printed on the spot. Founder and CEO Dan Shapiro -- who previously founded Robot Turtles, Google Comparison, Sparkbuy and Photobucket -- pulled up an Entrepreneur logo on the spot to engrave and cut this puzzle from a piece of maple wood. Shapiro says he got interested in lasers back in college, when he made money doing DJ sets with light shows. 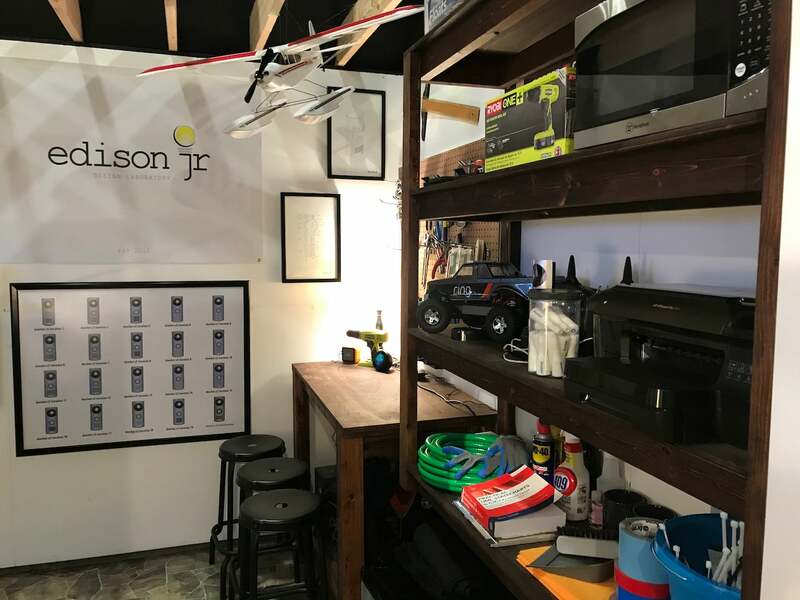 Now, his newest company's laser printer helps makers produce masks, handbags, drones, baked goods, surgical tools and more. In 2015, Glowforge's wildly successful crowdfunding campaign garnered $27.9 million in pre-orders -- the biggest 30-day crowdfund history. A product demo in my Lyft Line. A slice of life at CES. A random robot and a guy on a laptop sitting on the floor: CES in a nutshell. Hey Google, sorry about the rain. Google’s outdoor exhibits at the Las Vegas Convention Center were out of service due to the pouring rain on Tuesday. This was a bummer for the company, given that this is Google’s first year participating at CES. The larger booth was in a parking lot, but this smaller installation was also covered in tarps. An immersive look at how Volkswagens are made. Nvidia featured a station where attendees could try out its Holodeck collaborative tool. Engineers from around the world collaborate to develop new vehicles in virtual reality environments that incorporate visual, voice and haptic communication. Other stakeholders can also review designs in VR. My test ride in a Byton. I got to “test ride” in a smart car made by Byton, which was really more of an interview in a stationary vehicle, due to the pouring rain. But it was still cool to see some of the concept vehicle’s features in real life. (I’d spoken with CEO Carsten Breitfeld about the technology a few days before CES.) Read more about Byton, an electric vehicle slated to roll out in China in 2019, at the link below. The rain got the best of the Las Vegas Convention Center. The roof was leaking in the Central Hall. The following day was sunny, but flooding caused a power outage in this room that lasted nearly two hours. As relaxing as CES gets. Brio’s row of massage chairs drew a long line of weary attendees looking for a few minutes of relaxation during the hectic week. Just another example of how CES is full of surprises: Shaquille O’Neal walked onstage at the Turner Sports booth to play Street Fighter right as I approached this area of the Sands Expo & Convention Center. A smart home away from home. Lots of companies construct creative, elaborate booths, but smart home company and CES 2018 Innovation Award winner Ring made an actual house, complete with a yard. There were only a couple of rooms inside, but those, too, went above and beyond. See the garage below. Fun fact: I got a bit lost on Wednesday afternoon, and the only way I knew I was going in circles was that I passed this booth/house a second time. Being on a trip usually means I eat fewer vegetables, and those served at the CES convention centers have not seemed too appealing. It’s a little pathetic how excited I was to see fresh produce in this Opcom hydroponic GrowPod. A stuffed duck that provides support for kids with cancer. Aflac and Sproutel partnered to create this therapeutic stuffed duck for kids with cancer. It’s a social robot that contains an RFID chip with information for children about chemo and emoji cards to help kids express what they’re feeling, and it quacks and makes lifelike movements. Aflac plans to provide the duck to every child with cancer in the U.S. for free. Serendipity again! Entrepreneur magazine Editor-in-Chief Jason Feifer spots me. A woman at this Philips booth in the Sleep Tech marketplace convinced me to listen to an introductory spiel that had little practical value and no product information. She also gave me the honor of holding this Teddy bear which I really hoped was filled with sleep sensors, but alas, it was just an analog bear. While I was sitting there, I heard my name. I peeled away the mask and headphones to see Jason Feifer, the editor-in-chief of Entrepreneur. He joined me for the session and the company spokesperson snapped this ridiculous photo. …used these phone-charging lockers on Thursday, a day after the #CESBlackout in another venue locked in people’s devices while the power was out.